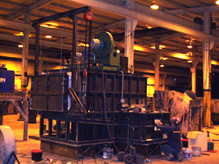 Hot Crews, Inc., is a refractory contractor providing refractory sales and service to Indiana, Michigan, Ohio, and the Midwest. We can provide turn-key installations, refractory maintenance, rebuilds and retrofits, dry-outs, tear-outs, demolition, precast custom shapes, and bake-out for precast items, shotcrete, and gunite. We also supply refractory materials, high-temperature flooring for molten metal spills (concrete replacement), furnace evaluations, and heat/thermal gradient transfers. In addition to our refractory services, we also stock an assortment of refractory materials including ceramic fiber from 4-10 lb. in density, castables, silicon carbide in several forms including brick and castable, plastics, brick, and stainless steel anchors. We supply materials from top manufacturers including Allied Mineral Products, Inc, ™, BNZ Materials ™, Minteq ™, Vesuvius ™, Louisville FireBrick ™, Thermal Ceramics ™, Resco ™, and Missouri Refractories ™. With our Brokk tear-out machine, Kobelco excavator, and Bobcat, we have the right equipment for furnace relining, demolition, rebuilds and retrofits, and tear-outs. At Hot Crews, we take safety very seriously. From the initial planning until project completion, safety is a major factor in everything we do and think about. Because we abide by the regulations set by the Occupational Safety and Health Administration (OSHA) and the Mine Safety annd Health Administration (MSHA) , we go above and beyond in ensuring worker safety. Contact us today for more information or to discuss the details of your next project.